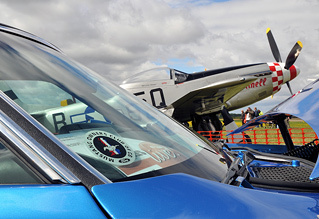 The annual charity air and car show held at Little Gransden, in rural Cambridgeshire, has firmly established itself as one of the gems of the UK airshow calendar. Since the first show was held some 18 years ago, tens of thousands of pounds have been raised for local charities and the BBC's Children In Need. 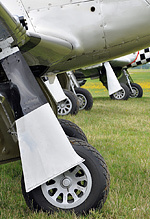 This year's show had a planned line up that some bigger shows would be proud of, including three P-51D Mustangs. Stuart Norris reports from windy Cambridgeshire. Additional photography by Phil Whalley and Trev Collins. That the event was held at all this year is a great testament to the team of volunteers that Dave Poile MBE, the shows organiser, is able to call on. The airfield itself is surrounded by farmland and this provides the only means of parking at the venue. The weather during the week leading up to the show was awful with heavy rainfall. This had the potential to turn the car parks into mud baths. However the laying down off 220 tonnes of tarmac planings meant the car parks would be in good enough condition to enable the show to go ahead. Another of the elements, the wind, then tried its best to spoil the day. Blowing at some 15 to 20 knots straight down the runway the wind was "on crowd". It was clear that not all of the items that were due to appear would be able to do so. Seven display items including The Battle of Britain Memorial Flight's Dakota and Peter Holloway's Storch had to cancel. 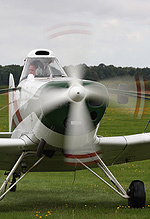 Most shows would feel the effects of this number of cancellations but the "spirit of Little Gransden" shone through and a pair of beautiful WACO biplanes was added to the flying display. Also making an unscheduled appearance was Spitfire Tr9 PV202, operated by Historic Flying Limited .The Spitfire performed a flypast on it's way to a nearby show and then performed another en-route back to Duxford. With the wind inevitably causing the flying programme to be rearranged Ken Ellis, who was providing the commentary as usual, kept the crowd up to date. He also reminded people that loose change can be a hazard and it'd be better placed in one of the charity buckets the volunteers bring round to collect money. Just before the flying was due to commence it started to rain. However it didn't amount to much and was soon blown away by the blustery wind. 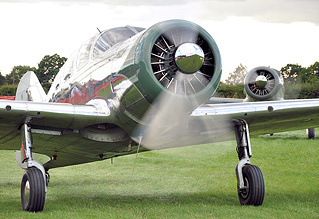 No sooner had the rain stopped then Peter Teichman ran in to open the show in his Hurricane IIb. Peter put on his usual immaculate display making full use of the double axis display line. Next came the Swift team flying a Pawnee, to initially tow the glider, and a solo twister. While the Twister performed its solo routine the Pawnee and glider were able to reach an altitude high enough for the glider to be released and put on its full aerobatic routine, something the crowd greatly appreciated. The RAF Tucano battled through the weather and managed to put on its full display routine although, due to the wind, it was somewhat distant. Given the strength of the wind this was understandable, safety is always the number one priority for air show organisers. This years line up featured a number of duos including the Red Hawks RF4 powered gliders, the Twister duo, Chipmunk and Bulldog and The Pitts Pair. Olivia Grace, older sister of pilot Richard Grace, took over the commentary for the Pitts pair display and her enthusiasm and factoids about the pilots, coupled with a polished routine from Richard and Dave Puleston, was well received by the crowd. Olivia has threatened to 'out' a different fact from Dave Puleston's apparently dodgy past at each display, and today's was that Dave holds the unofficial world record for eating marzipan, having downed a whole two blocks of the stuff, and keeping it down! The skill of all of the pilots to fly formation in the blustery conditions was impressive to say the least. Matthew Boddington was able to make a handful of passes in his splendid Fokker DR1 replica before heading home to Sywell, Ken Ellis speculated how long the flight may take given Matthew had a head wind to contend with! One person who was able to make use of the wind was John Elliot in his MT03 Autogyro. Always a joy to watch at these smaller venues John was able to fly his Autogyro sideways and even backwards, though he was forced to leave out his trade mark hands free pass. One of the features of the Little Gransden show is the service of remembrance, which this year had added poignancy given the 70th anniversary of the Battle of Britain. The minutes silence at the end of the service was impeccably observed. Following the service Mark Hooton displayed in the Vampire T11 before Mark Jefferies took to the skies in his Extra 330. 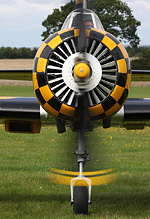 Mark's takeoff left the crowd gasping, and his display showed just why he's the nine times British aerobatic champion. Little Gransden regulars Nigel Willson in his Yak 52, the RV8 duo, Me 108, Bird Dog, a WACO and Bull Dog all displayed before Tom Maloney took his turn in the Strikemaster. Tom had hoped to display earlier in the day but was forced to land at North Weald due to the weather. However, in the spirit of Little Gransden, Tom waited for the weather to improve so he could display. The display was now reaching its finale and it was well worth the wait. First came the Spartan pair, first seen at last years show, followed by one of the WACO machines. These aircraft are simply stunning and they enjoyed some of the best conditions of the day. 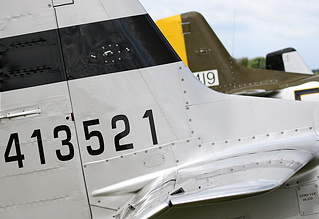 These two display items showed just why so many people hold Little Gransden in such high esteem. The final display item was a trio of P-51D Mustangs, Rob Davies in "Big Beautiful Doll", Maurice Hammond in "Marinell" and Dave Evans at the controls of "Janie". The unfortunate Me 108, which was still in the air after its display, was bounced by the three Mustangs and was forced to land. The Mustangs then flew a number of passes first in formation and then as a tail chase offering photographers numorous topside passes. Rob and Maurice then performed a tail chase as a pair before Dave flew a solo display. A couple more formation passes followed, the last one catching several people, including yours truly, by surprise. It was a superb way to end the show. As well as the flying display the show features a large number of vintage cars and bikes as well as the Ferrari owners club. All of this and the intimacy of the venue give a relaxed feel to the day that few shows can match. If you haven't sampled the spirit of Little Gransden yet make sure you get yourself to the show next year, you wont be disappointed.